Please check out our Slide Show! Our unit proudly serves the youth of the Tri-City area! The Young Marines is a very positive organization that teaches young people, ages 8 to 18, leadership, patriotism, respect for themselves and others. 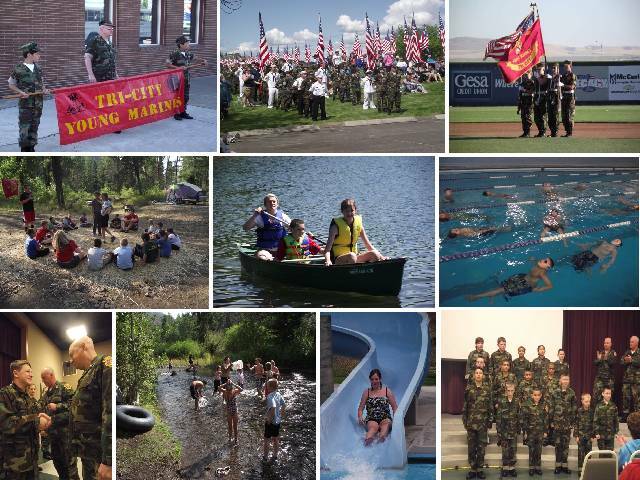 The Young Marines strengthens the lives of America’s youth by teaching the importance of self-confidence, academic achievement, honoring our veterans, good citizenship, community service, and a healthy, drug-free lifestyle. Young Marines learn new skills and earn rank. They earn ribbons in areas such as CPR, first aid, drug prevention training, conservation, academic achievement, community service, swimming, map reading, and physical fitness. The Young Marines program stresses “Health and Fitness.” Getting physically fit is part of getting mentally strong. Young Marines can participate in summer programs to provide leadership training and opportunities to visit national historic sites across the United States. Although the Young Marines is the U.S. Marine Corps’ official youth program to the Department of Defense for youth Drug Demand Reduction, the Young Marines is not a recruiting force for the U.S. Marine Corps. We strive to instill the core values of Honor, Courage, and Commitment adopted by the Marine Corps to each of our members.